As the world marked the 70th anniversary of Nazi Germany’s defeat in WWII, Ukraine has seen a wave of attacks against Victory Day symbols associated with May 9 celebrations in Russia and the former Soviet Union. On May 9, activists from the nationalist Ukrainian Svoboda ("Freedom") party were seen attacking people for wearing the traditional black-and-orange St. George ribbons or carrying red Victory Day banners in several cities across the country. Among those assaulted was the head of the Antifascist Committee in the western Ukrainian city of Lvov, pensioner and member of the Communist party Aleksandr Kalinyuk. He was sprayed with kefir (a fermented milk drink), and prevented from leaving his home to attend unofficial Victory Day celebrations. The video of the incident was posted on YouTube by Svoboda members, who later wrote on Facebook that "Kalinyuk and his Colorado ribbons and Soviet flags won't be attending," saying he was "grounded." "Colorado" is the derogatory term used in Ukraine for the St. George ribbon, referring to its resemblance to the color of the Colorado potato beetle. This year Ukrainian authorities have changed the way Victory Day is celebrated by introducing the Day of Remembrance and Reconciliation on May 8. It’s the first time they marked the occasion on the same day as Europe, instead of May 9 as Russia and other former Soviet states do. They also officially switched the traditional Soviet-era Victory Day symbols - the red banner and the St. George ribbon - to a stylized red-and-black poppy. Also in Lvov, an elderly man trying to lay flowers at a WWII memorial on May 9 was surrounded by people wearing Svoboda insignia. They shoved him and ripped the St. George ribbon from him. Police later escorted the man to the memorial, but told him wearing the ribbon was a "provocation," and did nothing about the attackers. In the video, the victim can be heard saying: "I am a free man! I have the right to wear whatever symbols I want. Is there democracy in Ukraine or not?" The leader of Svoboda activists, a member of the local parliament, then told the media that "this is going to happen to anyone who comes to any of Lvov's memorials with a red banner or with these symbols of Putin." Independent journalist Dmitry Lyashenko, a Lvov native, was beaten up by unidentified men on May 9 when he went to a square in the city center wearing a St. George ribbon. As a result of the attack he lost one eye and had his nose broken. Speaking to Life News network, Lyashenko said he had been receiving threats over the phone and Facebook some time before the assault. Across the country in Kharkov, a group of women on a V-Day march were assaulted by members of a local nationalist organization, who accused them of "pro-Russian" views. One of the women was sprayed with kefir for refusing to give up her banner. Further violence was prevented by police, local media report. In the Ukrainian capital Kiev, a march to lay flowers at a World War II memorial was attacked by camouflaged people. They used force, wrestling V-Day banners from the participants of the march, who had veterans among them. According to the "Ukrainian choice" civil rights group, there were no arrests or any official reaction to the assault. While the red banner and St. George ribbon are not officially banned, in the run-up to the celebrations the authorities warned Ukrainians against showing up in the streets with the symbols, saying it could be seen as a "provocation." "It is a European symbol. Let them wear any other ribbons in Russia, which now claims it won World War II," Prime Minister Arseny Yatsenyuk said. The St. George ribbon, besides being a traditional V-Day symbol in post-Soviet countries, was also taken up by rebels in the self-proclaimed Lugansk and Donetsk People's Republics in eastern Ukraine. Attacks on Victory Day celebrations were not uncommon in Ukraine even before the current crisis in relations with Russia. 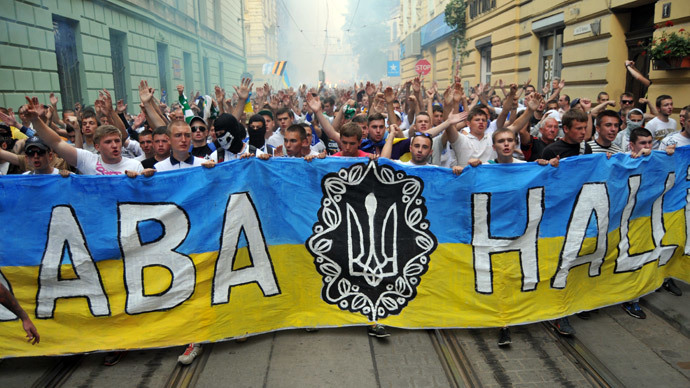 Some of the worst occurred on May 9 2011, when dozens of radical activists in Lvov attacked V-Day celebrators and veterans, calling them "Russian fascists." However, not only Ukraine has seen attacks on veterans in the wake of the 70th anniversary of Nazi Germany’s defeat. In Russia's Leningrad region (near St. Petersburg), three schoolchildren attacked a 77-year old Nazi death camp survivor, pelting him with stones. The veteran was not seriously hurt, and the underage attackers were taken to police for a spoken reprimand.